Actress Tabu, who has made several films with long-time friend Ajay Devgn, says she 'enjoys working with the actor,' reports mid-day. Tabu and Ajay Devgn have co-starred in films such as Vijaypath, Haqeeqat, Takshak, Drishyam and Golmaal Again, which released last year. Now, they are all set to share screen space in an untitled film. "When I'm working with him, it doesn't feel like work because we've known each other since the time we weren't even part of the industry. I like being around people who do a lot of masti and that's why I enjoy working with Ajay," she told mid-day. Of the rom-com with Ajay Devgn, Tabu, who earlier said that she likes doing comedy films, told mid-day, "It is a genre that I prefer doing with Ajay." Their film Golmaal Again was hugely successful at the box office and earned over Rs 200 crore. In an interview to news agency PTI, Tabu had earlier said she will never say 'no' to a film with Ajay Devgn, whom she has known for more many years. "Ajay and I are childhood friends. It is always an added benefit to be working with him. I will not say no to a film with Ajay. If he ever offers me anything as a director or producer, I will definitely do it. We are teaming up again for a film with Luv Ranjan (producer) and Ajay and everyone thinks I am the right choice for the film," she had said. Meanwhile, it is because of Ajay Devgn that Tabu is still single. Didn't know this? 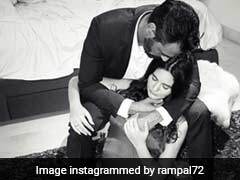 She explained to Mumbai Mirror that her cousin and Ajay Devgn (who were neighbours and close friends) 'spied' on her and 'threatened to beat up any boys who were caught talking to her.' "They were the big bullies and if I am single today, it is because of Ajay. I hope he repents and regrets what he did. I told him the other day to please find me a boy to marry," she said. Meanwhile, Tabu and Ajay Devgn's untitled film also stars Rakul Preet Singh and is slated for a Dusshera release.